I usually shy away from reviewing health and beauty products, but I jumped at the opportunity to review the Neutrogena UltraSheer Liquid SPF 70 Sunblock. I have a very pale complexion, and I'm always searching for good products that offer sun protection. Sunscreen is not an option for my family, it is a necessity. I don't tan in the sun, I burn! Finding a sunscreen that works on my break-out prone face isn't an easy task and I'm usually disappointed when I try switching brands, so I wasn't expecting much out of this sunscreen. Surprisingly, I must say so far I'm quite pleased with this particular formulation. This summer we've been out in the sun a great deal. For two weeks straight my daughter attended 1/2 hour swim lessons, so every day we were out in the sun for an extended period. I applied the sunscreen daily to my face in the morning according to the directions on the package. The liquid comes in a small 1.4 oz bottle. When you shake it up you can hear a little ball inside that helps to mix the liquid. Not only did I not burn while wearing this sunblock, but I really like the way this sunblock feels on my skin. The non-oily liquid has a silky smooth, light consistency and applies to the skin easily. The only concern I have is about the Environmental Working Group score for this product - concerned consumers can access the report at http://www.ewg.org/2010sunscreen/finding-the-best-sunscreens/314602/Neutrogena-Ultra-Sheer-Liquid-Daily-Sunblock-SPF. However, ingredients like Oxybenzone are approved by the FDA and are used in many brands of sunscreen even though the EWG has concerns with them. I did not try applying this sunblock on my children because in my opinion, there are other products out there better suited for children. Based on my experiences so far, I plan to continue using this product occasionally on my own face when I need sun protection. In fact, I have a bottle in my purse right now! 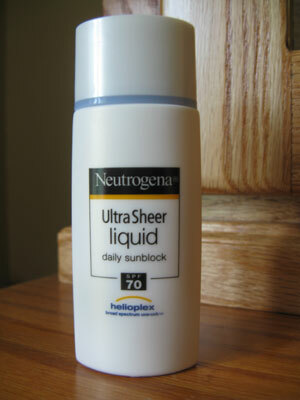 Coupon for $2 off your UltraSheer® purchase: http://www.neutrogena.com/suncoupon.